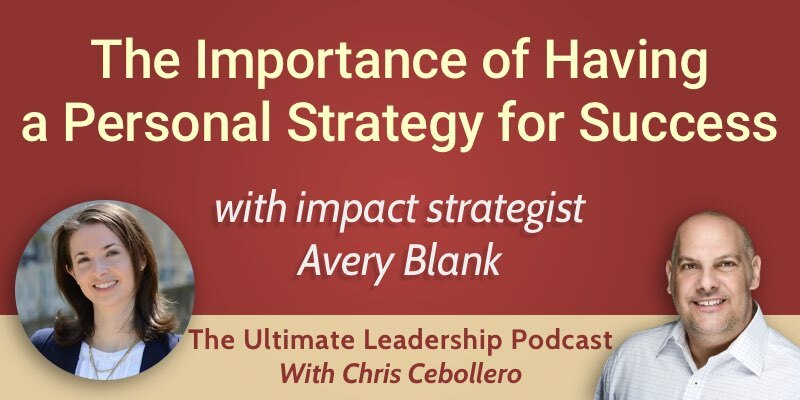 Impact strategist Avery Blank is our guest this week. She talks about why having a strategy is crucial to your success, and how to create one and progress your career. Leadership is both an art and a science. You have to be able to understand the science before you can paint the portrait of organizational success. Success doesn’t happen by chance. American comedian Milton Berle once said that if opportunity doesn’t knock, build a door. Women are expected to mostly be team players, and not be so much focused on themselves. Being strategic about your career is about having a plan: knowing where you want to go and how to get there. Strategy is a key to success. How do you become a strategic thinker and use it to progress your career? First, you need to think about what you want, and then identify the steps that will lead you to your goal. Second, you need to be aware of what’s going on around you. You may have a goal, but you also need to understand how other things might impact your goal. You need to understand the context in which your goal sits. Third, put yourself in other people’s shoes. Understand what it is that other people want or value. In order to add value, you have to be valuable to someone else. Where should you start developing your strategic plan? You have to take small steps. Sometimes our goals are massive, and we don’t know where to start. Make daily, weekly, monthly sub-goals that continue to move you closer to your ultimate goal. Also, write it down. When you see it, you can pursue it better. Sometimes people are hesitant to put down numbers. Share your goals with others, if it helps you to be more accountable. If you are not intrinsically motivated to achieve your goal, it’s going to be difficult for you to do so. It has to come from you. You have to want it more than anyone else. How do you market yourself for maximum exposure? Your mindset is critical to your future success. You are your best advocate. You have to identify your opportunities. Every great company has a marketing team. You have to think of your career as your business, and you have to be your own marketer. It’s absolutely critical to know what is going on around the world. Our knowledge is only valuable if it’s timely. People are not going to listen to you or pay for your services if what you say or what you provide is outdated. The brands that survive are the ones that keep up with the times. Your career is your business and your brand. How does my knowledge apply to what is happening in the world? How is the world impacting my work? Avery is constantly reading, keeping up with the news, with current trends. It takes discipline to stay updated with what’s going on in the world. Staying current with the news is a career advancement strategy. Some people think it’s wasting time. It’s not. It’s strategic. Keeping up with the news allows you to see opportunities.